Those who make the journey to the end of Lock 5 Island are rewarded with the unforgettable experience of reaching Eagle Point. Following the trail to the left of the Dix Bridge and along the edge of the Hudson, visitors will find themselves discovering peaceful overlooks, quiet spaces to reflect, and stunning views of the river. At the end of the island Eagle Point reveals itself to be one of the most dramatic places within Hudson Crossing Park, with a breathtaking lookout over the Northumberland Dam and Saratoga Falls as well as home to a historic recreation of the Lock 10 Lock Tender's Shanty, and original Champlain Canal lock wall stones tucked among the flowers and plantings. A perfect place to enjoy a picnic or simply to explore, Eagle Point is an easy walk that is just over one mile from the Dix Bridge and parking lot. Constructed in the memory of longtime friend and Hudson Crossing Park supporter Louise Landry, this quiet spot overlooks the Hudson River and provides visitors a peaceful spot to sit, rest their feet, and enjoy the view. The Overlook, located just beyond the Dix Bridge, marks the location that British General John Burgoyne crossed the Hudson River in the fall of 1777 with his troops on the famed “Bridge of Boats”. Special thanks to all who have donated on behalf of Louise in order to make this space possible, and to the entire Landry family for memorializing their loving wife and mother in this way. Walking along Eagle Point Trail visitors will spot concrete and stone piers spanning the Hudson River. The stone piers are the remnants of the Greenwich and Schuylerville Electric Railroad that once served Greenwich and Schuylerville. Just a bit further upstream visitors will notice the Boston-Maine Railroad trestle piers, which mark the path trains once took hauling industry and agricultural products between Saratoga and Washington Counties. The Greenwich and Schuylerville Electric Railroad was established in 1895, and by 1900 the service between Greenwich and Schuylerville was complete. Trolleys ran from Greenwich to Thomson until 1928 as part of the Hudson Valley Railway, when the tracks near Clarks Mills were washed out in a flood. The Greenwich and Johnsonville Railway Company built a bridge in 1902 as a part of a seven mile railway spur to connect the mills and manufacturers in Schuylerville and Greenwich. Eventually, the rail bridge would connect the Thomson Mills, as well as the 20 paper and knitting mills surrounding Schuylerville, with the line to the Boston and Maine. Rail traffic ran through Schuylerville into the 1950s and the pylons are still visible from multiple points along the HCP trails to remind us of these fascinating pieces of local history! As visitors walk along edge of Hudson Crossing Park's field and the Hudson River, those who are enjoying the journey may come across The Birding Overlook, also known as Hudson Crossing Park's "Secret Garden". This secluded nook includes a bench, naturalizing plants and a wonderful view of the river. Created in honor of Myrtle Berkowitz, The Birding Overlook is north of the Dix Bridge and offers a peaceful spot to watch for wildlife and admire the rolling river. Special thanks to all who have donated their time and plants to create this place, including the members of the Living Waters Church of God outreach group, Fish Creek Garden Center, Jody, Julie, Alan, Marlene, Darryl, Cindy, and Louise. Additional thanks to all who made donations to the Park in Mrs. Berkowitz's name. We hope that you will visit and feel her love of nature as you rest on the lovely bench overlooking the water. 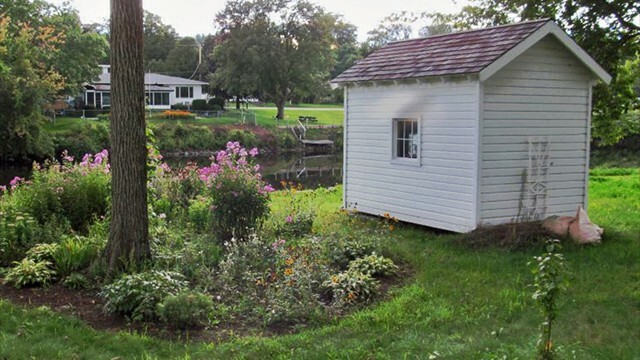 On the site of Lock 10 visitors will find a replica of the original lock tender's shanty. It was built according to historically accurate plans by the students of the Schuylerville High School Shop Class in 2010. 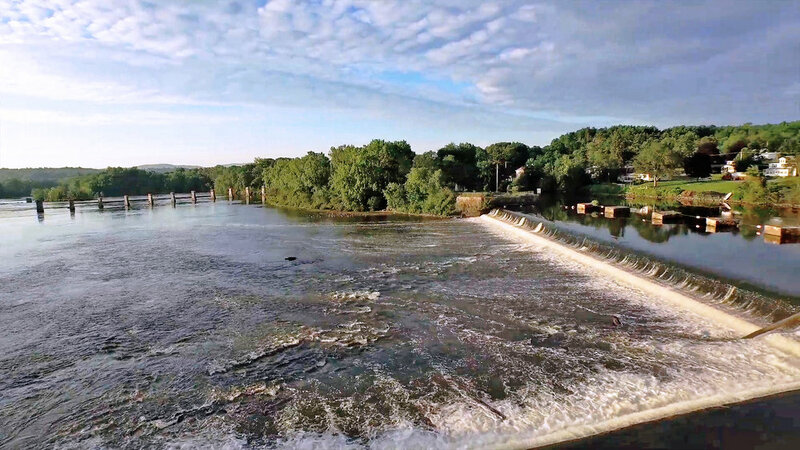 Learn more about the Lock 10 history as well as an account of the local folk story of The Tragedy of Saratoga Falls by clicking the button below. From Eagle Point visitors are offered stunning views of Saratoga Falls, part of the Northumberland Dam. Originally constructed in 1822 to control the flow of water in the Hudson River and the Champlain Canal, it was an important structure because it created a navigable pool of water in the Hudson where the canal crossed the river. It also provided waterpower to early saw mills and local industries that developed on both sides of the river. The L-shape of the dam helped maintain an even water level in the lock chamber, while allowing excess water to spill over the dam and continue down the natural course of the river. The stone pylons prevent boats from being caught in the current. After three years of collaborative work between HCP, NYS Canal Corporation, and the NY State's Historic Preservation Office, thirty historic Lock Wall Stones - believed to be from the original Champlain Canal at a lock near Cohoes - now serve as one of the focal points of Eagle Point and a perfect place to rest your feet or enjoy a picnic lunch after walking the trails. Interpretive signage, made possible by a NYS Scenic Byway grant, depict stories of the original Champlain Canal, the Lock #10 Locktenders' shanty, and the historic Lock Wall Stones. HCP is grateful to all who helped bring the stones to their new home where they may now be enjoyed by the public.